The Intergovernmental Panel on Climate Change estimates that around the world glaciers (excluding the Greenland and Antarctic ice sheets) will decrease in volume between 15 to 55 percent by 2100 even if we are able to limit global warming to under 2˚C; they could shrink up to 85 percent if warming increases much more. In Earth’s history, there have been at least five major ice ages, when long-term cooling of the planet resulted in the expansion of ice sheets and glaciers. 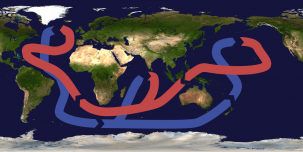 Past ice ages have been naturally set off by a numerous factors, most importantly, changes in the Earth’s orbit around the sun (Milankovitch cycles) and shifting tectonic plate movements that affect wind and ocean currents. The mixture of gases in the atmosphere (such as carbon dioxide and methane) as well as solar and volcanic activity are also contributing factors. Today we are in a warm interval—an interglacial—of Earth’s fifth ice age, the Quaternary Ice Age. The last glacial period of the Quaternary Ice Age (often referred to as the last ice age) peaked around 20,000 years ago. The Aletsch Glacier is the largest glacier in the Swiss Alps. A glacier is a large accumulation of ice, snow, rock, sediment and water on land that is moving down slope under its own weight and gravity. Today 10 percent of Earth’s land is covered by glaciers (including Antarctica and Greenland). They contain 75 percent of the planet’s freshwater, storing it as ice during the cold season and releasing some of it as meltwater during summer months. Runoff from glaciers cools the streams below, providing habitat for plants and animals during dry periods. More than one-sixth of the world’s population, particularly in China, India and other Asian countries, live in the basins of glacier-fed rivers and depend on them for drinking and irrigation water. A glacier’s mass balance determines if it will advance or retreat. If the amount of snow and ice accumulated during winter is less than the melting that takes place in summer, the glacier is considered to have a negative mass balance and retreats. Today, nearly all glaciers have a negative mass balance due to global warming and changes in precipitation. New Zealand has over 3,000 glaciers. In New Zealand’s Southern Alps, Joerg Schaefer, a research professor at Lamont-Doherty Earth Observatory, and his colleagues chemically analyzed elements in rocks that were left uncovered when glaciers retreated 20,000 years ago at the end of the last ice age. They figured out how long the rocks had been exposed, then reconstructed local glacial records and compared them to other records such as Antarctic ice cores, which reveal changing atmospheric carbon dioxide levels. Earth is actually due for a natural new ice age, explained Schaefer. Typically the interglacial between ice ages lasts 10,000 to 12,000 years, and we are already 12,000 years into this one. A natural cooling cycle should be starting, but even if it does, said Schaefer, we will not see evidence of it because humans have so altered conditions on the planet by burning fossil fuels. 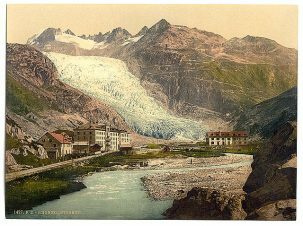 Schaefer has been working on a global survey of mountain glaciers, comparing glacier retreat over the last 150 years to how glaciers behaved in the past, particularly at the end of the last ice age. “That [the transition out of the last ice age] was one of the most dramatic geological and natural changes that the Earth has seen,” he said. Humans are exacerbating glacial melt because burning fossil fuels not only releases CO2, it also emits black carbon, a tiny component of air pollution that can absorb one million times more solar energy than CO2. When black carbon falls to earth with precipitation, it darkens the snow and ice, reduces their albedo (the reflecting power of a surface), warms the snow, and speeds up melting. Here are a few examples of the glaciers we are losing. 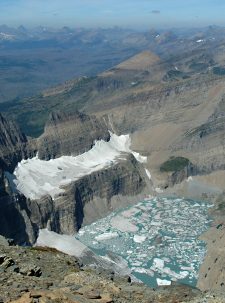 Montana’s Glacier National Park had 150 glaciers in 1850; today there are 25. 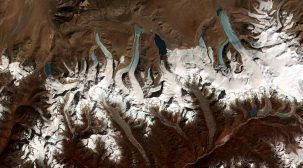 The greater Himalayas, which contain nearly one-third of Earth’s non-polar ice, have warmed much more than the global average over the last 100 years; between 1950 and 2000, 82 percent of glaciers in western China shrank. 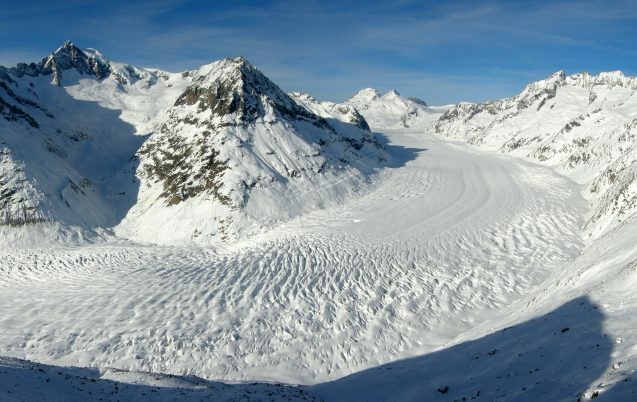 The Aletsch Glacier, the largest in Switzerland, retreated 1.7 miles between 1880 and 2009. By 2000, the Furtwangler Glacier on top of Mount Kilimanjaro in Tanzania was half the size it was in 1976. If the melting continues over the next few decades, some of the world’s most populous areas could run out of water during the dry season. 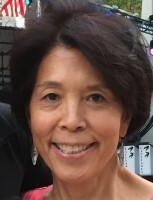 For awhile, the increase in flow from melting ice and snow during the dry season will seem like a boon, but in the future, the downstream flow’s variability will increase and eventually flow could disappear altogether, impacting food production, biodiversity and economic growth. Communities around the world rely on glacial water that has been dammed for the production of hydropower. Retreating glaciers will increase the variability of flow or decrease it, which will affect power generation. France gets about 75 percent of its electricity from nuclear power plants, half of which are on the Rhone River, fed by the rapidly retreating Rhone Glacier. Over the last 15 years, the Rhone River twice became so hot and water levels were so low in summer that nuclear power plants had to be shut down. As a result of glacial melting, glacial lake outburst floods are increasing. As glaciers shrink, meltwater can form a lake that is dammed by glacial debris (ice or soil and rock) at the tongue of the glacier. But those dams can be unstable and collapse under the pressure of more melting. Peru has experienced some of the most destructive glacial lake outburst floods; between 1941 and 1950, three such floods killed 6,000 people. 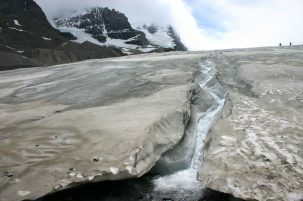 Glacial retreat can destablilize slopes, which can lead to landslides, and warming temperatures can trigger avalanches. In 2002, a huge portion of the Kolka Glacier on the Russia-Georgia border broke off and, hastened by the meltwater underneath, created an avalanche that hurtled down the mountain at 150 miles per hour, killing over 100 people in the town below. The onrush lasted 7 minutes. 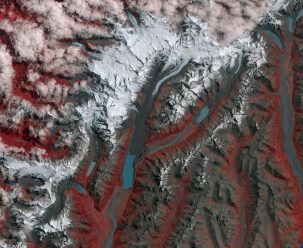 In July 2016, two avalanches occurred in Tibet, one of which killed nine people. If all the world’s glacial ice were to melt, sea levels would rise 265 feet as the meltwater flowed into rivers and ended up in the ocean. Most sea level rise would come from Antarctica and Greenland in the Arctic, not mountain glaciers, which would contribute only about 20 inches. Recent research about melting glaciers in the Arctic (which has been warming twice as fast as the rest of the world for the last half-century) and Antarctica suggest that the low-end projections for sea level rise made by the Intergovernmental Panel on Climate Change are too low. In its most recent report, the Panel projected that if we are able to reduce emissions significantly, sea levels could rise 11 to 24 inches by 2100; if emissions remain high, we could see a rise of 20 to 38 inches. 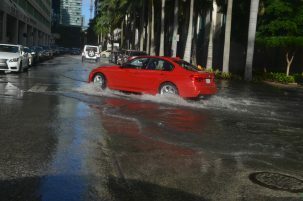 Sea level rise will cause coastal flooding, erosion, damage to infrastructure and buildings, ecosystem changes and compromised drinking water sources. The freshwater from glacial melt flowing into the oceans has an impact not only on sea levels, but also on ocean acidification, biological productivity and weather patterns. The amount of freshwater in the upper layers of the Arctic Ocean, which has increased 11 percent since its 1980-2000 average, could also affect circulation in the Nordic Sea and the Atlantic Ocean. The influx of freshwater could potentially disrupt or slow down the “Global Ocean Conveyer,” the regular cycling of cold water south and warm water north through the Atlantic Ocean that plays a huge part in the climate of North America and Western Europe, as well as in ocean nutrient and carbon dioxide cycles. Pollutants like pesticides, heavy metals, persistent organic pollutants and PCBs, polychlorinated biphenyls, have made their way to the Arctic and Antarctica on ocean and wind currents. When the glaciers melt, pollutants once trapped in ice are released and can enter rivers, oceans and food webs where they bioaccumulate in marine creatures; those at the top of the food chain, like polar bears and humans, will be affected the most. In 2014, Ben Orlove, co-director of Earth Institute’s Center for Research in Environmental Decisions, launched Glacier Hub to share news about current research, and on how communities and organizations are addressing the challenges of glacial retreat. The article reads as if the Kolka glacier collapsed in 2016. It collapsed in 2002. Thank you for catching this error. I have corrected it. 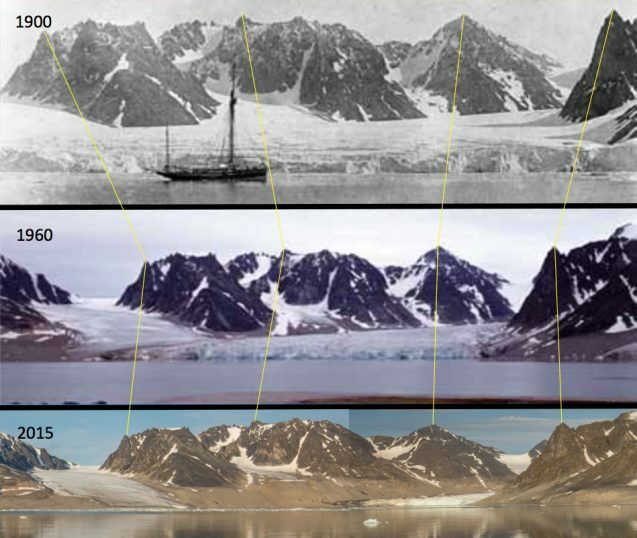 This article is full of examples of disappearing glaciers, but also says “will decrease in volume between 15 to 55 percent by 2100.” 15% seems like very little given the doom and gloom in the report. I’m not a climate doubter at all, but this article is confusing.